As you take your workout to the next level, run that extra mile (or 5), try a new spinning class, or dance like there is no tomorrow, your body loses essential electrolytes, which can cause cramping, fatigue, and can leave you unfocused—making it harder to finish your workout. You need a way to replenish those electrolytes and stay on top of your training. Electrolytes are minerals such as calcium, magnesium, chloride, sodium and potassium that are found in the blood and carried to all parts of the body. They are electrically charged and play a very crucial role in proper nerve and muscle function. If you ever feel a cramp coming on while training, it could be because you are low in electrolytes and your muscles aren’t functioning like they should. The best way to maintain an adequate supply of electrolytes is by getting enough foods like fruits and vegetables that are high in electrolytes. But when you need to replenish more quickly, electrolyte drinks are a convenient way to help you recover. When you hear the word "electrolyte drink," you may think of one of those sugary sports drinks in a variety of flavors and colors. While it’s true those are formulated to hydrate and replenish your electrolytes, they are also loaded with sugar and other added ingredients that won’t help you achieve your goals. An electrolyte supplement, such as electrolyte powder that can simply be added to water, is a great way to replenish your electrolytes without all the added carbs and calories. For women who work out because they are wanting to lose weight, depleting the electrolyte reserve may be a result. Taking an electrolyte supplement is the perfect way to replace your electrolytes without feeling like you have to head right back out to the gym to burn off added calories from sugary drinks. There may be some electrolyte powders that do contain added refined sugars though, so make sure you look at the label to make sure you're getting important electrolytes and not filling up on added sugars. Even if you aren’t specifically trying to lose weight, if you are an active woman, you are almost certainly not looking to add extra empty calories. One other likely benefit for women who are taking electrolyte supplements is that you are helping your body prevent dehydration in multiple ways. When you have an electrolyte imbalance, particularly a sodium deficiency, the amount of water in your body decreases and you can become dehydrated. Making sure you keep your electrolyte levels at a good place is a great way to help prevent dehydration. Taking an electrolyte powder with water is also a good way to prevent dehydration because you are simply drinking more water. Electrolyte powders can also help with dehydration with added ingredients, like coconut water, that are known to improve hydration. Taking an electrolyte supplement will help you balance your electrolyte levels, which will allow your muscles to recover better and help you have the energy you need to take on the rest of your day! Many sports drinks contain loads of sugar and other ingredients that you don’t need. With only 6g of sugar and 25 calories, IdealLean Electrolytes contains a good balance of sugars and calories so that you can stay energized and reach your fitness goals faster. You’ll be able to take your results to the next level with essential electrolytes like sodium, potassium, magnesium, chloride, calcium, along with vitamins and minerals, and coconut water powder. 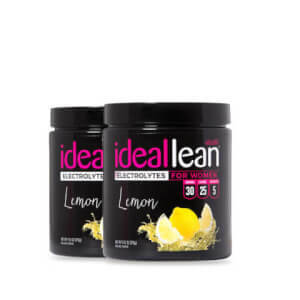 IdealLean Electrolyte supplement drink will rehydrate, restore, and refresh so you can take on anything that comes your way. Can I view IdealLean Electrolytes's Nutritional facts? Dextrose, Organic Evaporated Cane Juice, Coconut Water, Citric Acid, Sodium Citrate, Natural Flavors, Salt (Sodium Chloride), Tripotassium Citrate, Magnesium Citrate, Magnesium Gluconate, Sucralose, Ascorbic Acid (Vitamin C), Calcium Citrate, Potassium Chloride, Beta Carotene, Niacin (Vitamin B3), Pyridoxine HCl (Vitamin B6), Cholecalciferol (Vitamin D3). Electrolytes are charged minerals that are essential for the body to maintain homeostasis as well as perform bodily functions. Why should I drink IdealLean Electrolytes? 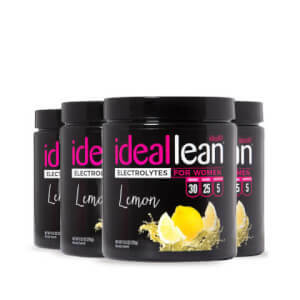 IdealLean Electrolytes is designed for endurance athletes in order to help restore essential minerals lost from the body in sweat as well as to help rehydrate them. 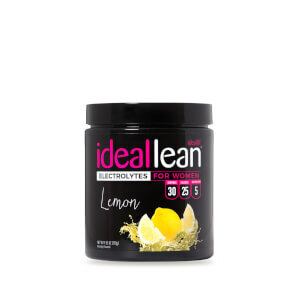 Who should take IdealLean Electrolytes? Long distance runners, cyclists, hot yogis, cardio bunnies who work out for more than an hour, dancers, or anyone who sweats a lot while exercising. Isn’t sodium bad for you? Why are there such high amounts in this product? Sodium is an electrolyte that is essential for many of the functions of the body. It is primarily responsible for water balance and blood pressure regulation. It is necessary in endurance supplements due to the amount of sodium excreted in sweat. When is the best time to take IdealLean Electrolyte? The best time to take this product is during your workout. Especially if you are in the heat or performing an endurance based workout. Where are the tree nuts coming from in the allergen statement? The tree nuts come from the coconut water powder. The FDA considers coconut to be a tree nut. This product contains 25 calories all coming from dextrose and organic evaporated cane juice (sugar). These types of sugar are meant to quickly enter the body and be used for energy. How much can I take a day? This product is only meant to be taken during exercise or working outside in the heat. If you are doing this multiple times a day you can take it each time. If taken without exercise it is not harmful. It just won’t provide the same benefits. Does this product contain any caffeine? No. This product is designed for endurance training in which caffeine is not often used. How many servings per tub? Yes, it is certified gluten free.